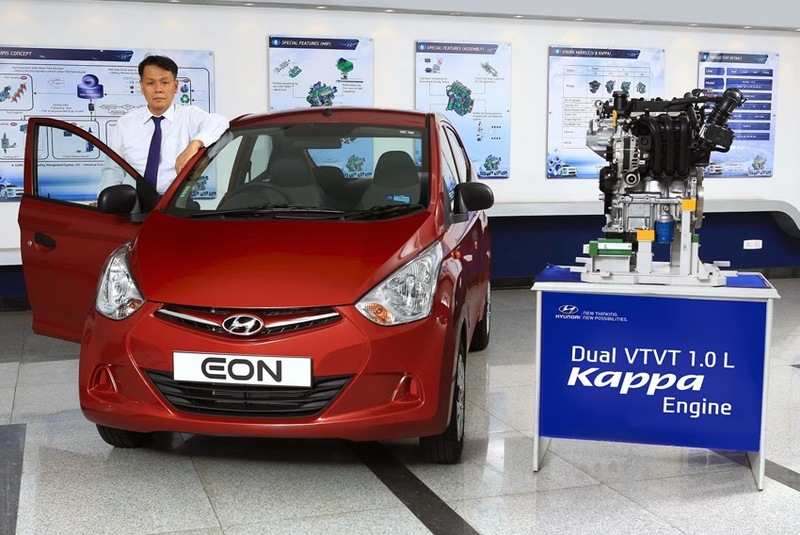 Hyundai Motor India Limited (HMIL) introduced the advanced 1.0-litre Kappa engine for the India's trendsetter Eon. The new 1.0-litre Eon will be available along with the current 0.8-litre Eon. Dual VTVT technology and designed to deliver high engine performance, with enhanced fuel efficiency andlow emissions. The advanced 1.0-litre three-cylinder engine delivers high power of 69 ps @ 6,200 rpm and peak torque at 9.6 kgm at 3,500 rpm for enhanced driving experience resulting in less frequent gear shifting and high fuel efficiency of 20.3 kmpl (ARAI Certified). "Hyundai Eon has been a trendsetter of style, performance, design and finesse in its segment and has received good acceptability and appreciation from its customers. Hyundai consistently innovates to meet and exceed the demands of the customer and the 1.0-litre Kappa engine now offered in Eon is an extension of our modern-premium brand philosophy and will delight our customers with unparalleled driving experience and further consolidate Hyundai's position in the domestic market," said B.S. Seo, Managing Director and CEO, HMIL. The all-aluminum 1.0-litre Kappa engine promises weight reduction with adoption of aluminum head and block that help achieve improved fuel economy. Moreover to minimise the noise, vibration & harshness levels (NVH), low friction timing chain has been adopted while the piston cooling jets ensures optimum piston temperature for most efficient engine working for higher fuel economy & enhanced engine performance. The 1.0-litre engine is mated with 5-speed manual gearbox which offers smooth gear shifting and has low noise gear design for improved NVH. The Eon 1.0 Kappa engine will be available in Magna+ variant at an ex-showroom price (New Delhi) of Rs. 383,130.